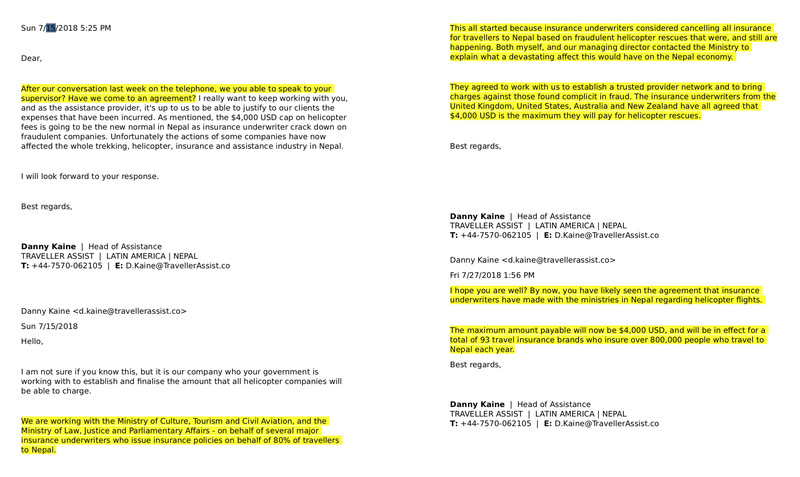 On Sunday night, The Kathmandu Post published an investigation into an international medical assistance company, which had been using lies to threaten the government, private rescue agencies and hospitals in Nepal. The company, Traveller Assist, has responded in a detailed post on Medium, calling the Post’s reporting baseless and false. The Post has been reporting on the fraudulent helicopter rescue scam since last year when the story first surfaced in national and international media. On Sunday’s story, the Post adequately cites from the government investigation committee’s report and the status of further investigation being conducted by the Central Investigation Bureau. — The Post does not claim that Traveller Assist threatened to stop issuing travel insurances policies. The lede in the story clearly says that in the letter, the company’s managing director threatened the government that his clients would stop issuing travel insurance. 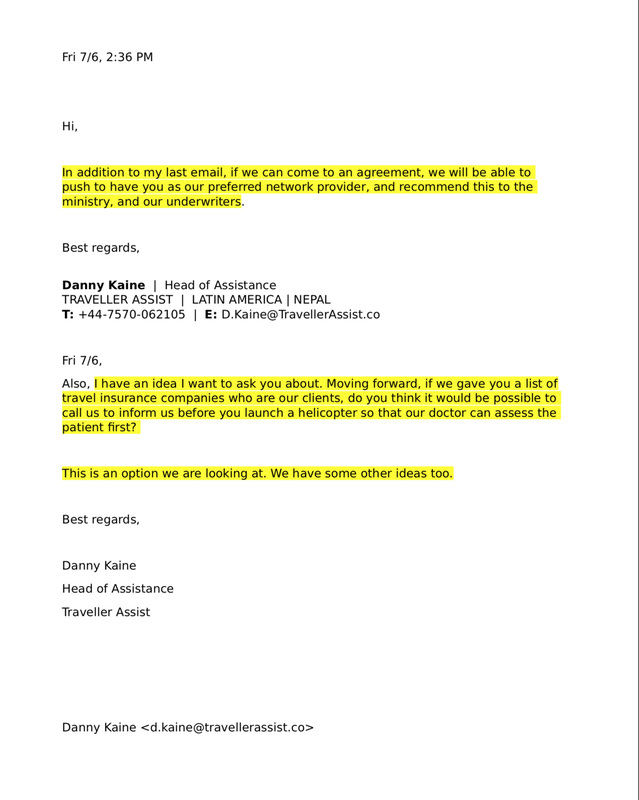 — Tourism Ministry officials told the Post that Traveller Assist first wrote an email on July 16, 2018, to Ms Meera Acharya at the Department of Tourism, where Danny Kaine introduced himself as head of assistance for Traveller Assist. 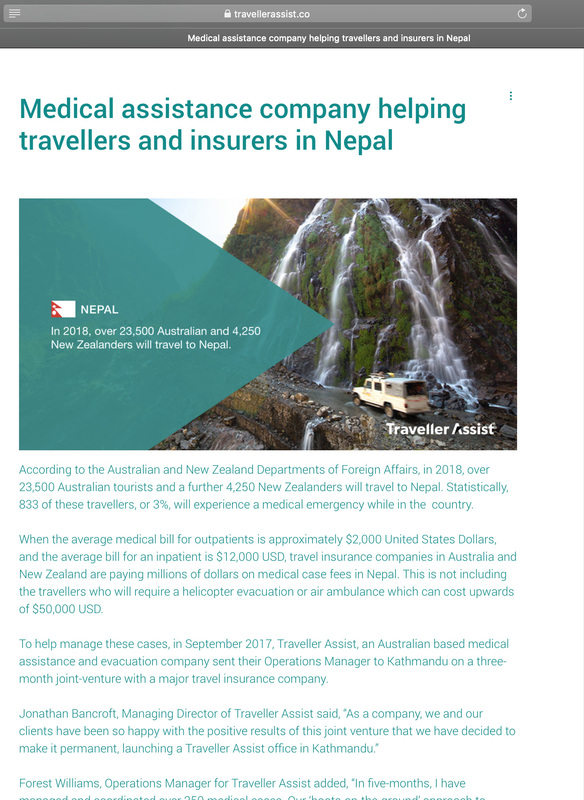 The Post story says that the government’s investigation committee probed 10 helicopter companies, six hospitals and 36 travel, trekking and rescue agencies for quoting “exorbitant rates” and making claims against tourist insurance policies. In an interview with the Post, Rabindra Adhikari, the Minister of Tourism, said that the investigation into the fraudulent helicopter rescue scams is ongoing, and now with the Central Investigation Bureau. — In the emails that the Post obtained from a leading Kathmandu-based hospital, Kaine writes, “We ask that you please contact us directly for the list of insurers that we have submitted. Unfortunately, if this does not happen, we have been directed by these insurers to blacklist [hospital name removed] and not to direct care to your hospital.” The Post cannot publish the image of the email because it would breach confidentiality agreement with the source. — The Post, in its report, quoted official email confirmations sent by respective insurance brands, including official emails sent to FCI and the Kathmandu-based hospital. The official confirmations dismiss Kaine’s claims to be the sole representative in Nepal during the same time period which contradicts Kaine’s claims that his firm had a signed contract in place with every single insurance brand on the list he sent to several providers in Nepal. Our report also clearly points out that one of the insurance companies had a three-month trial agreement with Traveller Assist. 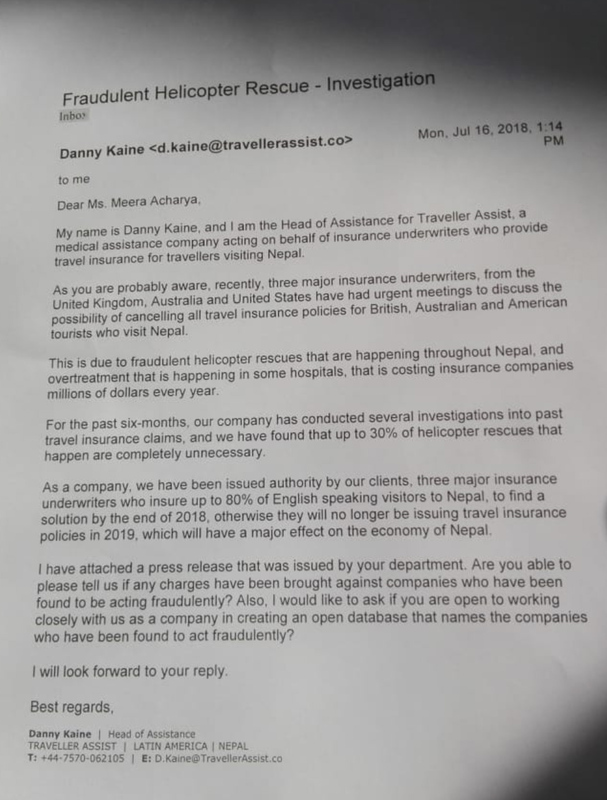 — In his emails to Nepal-based companies, Kaine claims that Traveller Assist is the sole representative of major insurance brands and that all procedures, including payments, should be done under Traveller Assist’s terms and conditions. On Sunday, the company’s managing director confirmed in his Medium Post that his representative did send emails to various parties in Nepal. However, in an interview on Jan. 29 with Nepali Times, Kaine told a reporter that the emails were fabricated. — In the letter to the ministry’s undersecretary, Kaine writes that the firm “is working with the governments of the UK, Australia, New Zealand, Canada and the US to make it an illegal offence to leave the country without travel insurance.” The Post’s report does not dismiss the insurance fraud and lists the names of all parties—including helicopter companies, hospitals and rescue agencies—under investigation by the ministry and concerned authorities. — Post’s story already says that Kaine told Nepal’s government official that his clients wanted to set up a joint coordination centre so all emergency calls would be handled by Traveller Assist. — The company's managing director misquotes how the Post refers to Kaine's emails. 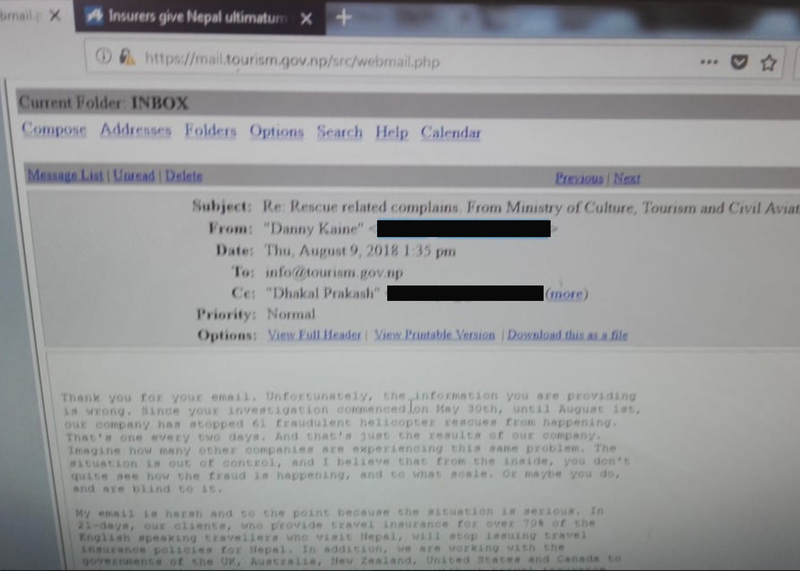 In the email sent on July 15, 2018 to FCI, Kaine writes this exact sentence: "We are working with the Ministry of Culture, Tourism and Civil Aviation and the Ministry of Law, Justice and Parliamentary Affairs-on behalf of several major insurance underwriters who issue insurance policies on behalf of 80% of travellers to Nepal." The company has contested this in the Medium post. Below is a copy of the email’s screenshot. Once again, these exact set of emails have been submitted by FCI to the official investigation committee that oversaw the probe. 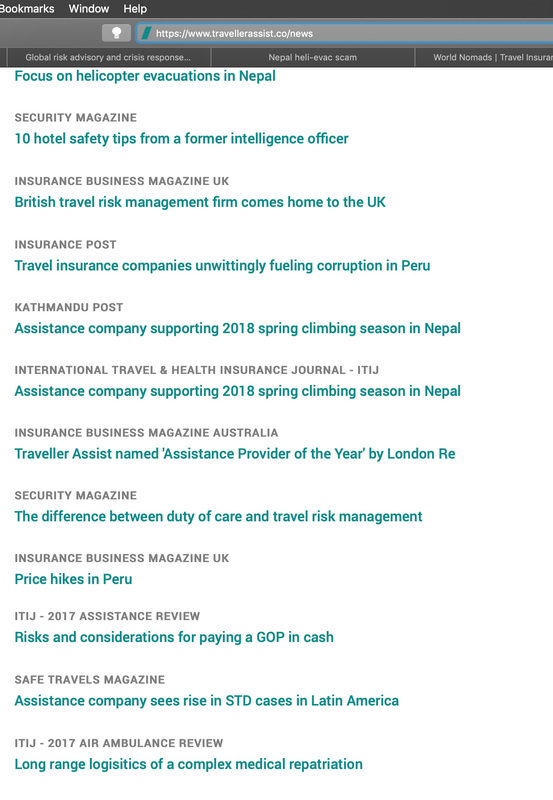 — The Post worked on a comprehensive report and cross-checked various claims Traveller Assist made on its official website and Twitter account that it has an office in Kathmandu. As mentioned in our report, Kaine’s claim that the firm has no office in Nepal is in stark contradiction to what the firm mentions on its website and in a series of tweets. — Government officials, as well as the Central Investigation Bureau, told the Post that both Traveller Assist and Danny Kaine are currently under investigation, which the company's managing director has been aware of since the media reports on January 30. In the interview with the Post for the article, the bureau’s spokesperson Superintendent of Police Uma Chaturvedi confirmed that an investigation had been launched following the Tourism Ministry’s emergency meeting and directives in January, but refused to go into further details as the investigation is ongoing. Read the Post's full investigation here.